We move outside the country this week to Belgium, home to so many of the world’s greatest beers. Dupont is a small family-run brewery as well as a farm, that now produces bread and cheese as well for sale in their café/shop. The farm part of the business goes back to the mid 18th century. Beer production started a few years later, brewed mainly to quench the thirst of busy farm hands. The original Saison beer was fermented in the winter for drinking later in the year. Often the beer began a secondary fermentation in the barrel as temperatures rose; nowadays carbonation takes place in the bottle. Until recently the bottles came with a champagne-style mushroom cork and wire. Saison almost died out in the twentieth century until beer nuts in the U.S. began to take an interest. Today it is made in most beer-loving loving countries, including our own. 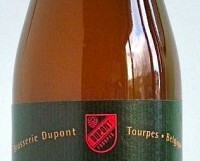 Saison Dupont is one of the most highly rated beers in the world, with a distinctive character said to derive from a unique group of yeasts used in brewing. It is medium-bodied and complex with refreshing fruit, a light bready, yeastiness, and a thirst-quenching bitterness. Great beer.